If you’re looking for a new slot to play this weekend then we bring you glad tidings as we’ve got 3 cracking new releases for you in the form of Wild Pixies, Spy Rise and Sky Queen. An enchanted forest is the setting for Wild Pixies, a 5 reel, 20 payline video slot from Pragmatic Play. The highlight of this fantasy adventure is the Roaming Wilds Free Spins feature that awards 8 free spins complete with roaming wilds. These roaming wilds are activated when you fill a meter by landing 2 wilds. They then drop onto the screen and dart around the reels for the rest of the round. They also add 2 extra free spins to your tally. Get the maximum 6 roaming wilds and you can see expect plenty of action. Pragmatic Play has become one of our favourite developers and the medium to high variance Wild Pixies is another good release. The theme isn’t usually one of our favourites but the blend of classy design and a top feature make it well worth a look. Play secret agent in the second new release, Spy Rise. It’s a 5 reel, 40 payline slot from Playtech that combines futuristic design with some unusual extras. Your first decision is whether to pay per spin to upgrade the value of the higher paying symbols. You can upgrade up to 4 symbols if you wish. In return, you can expect higher payouts when you land a winning combination made up of that symbol. The main bonus is the Free Games feature which awards 10 free spins. These are played on a win both ways game engine. If you were playing with the upgraded symbols on the triggering spin, then they are carried through to the free spins round too. Spy Rise also offers a chance to land a progressive jackpot prize. The range of bonuses isn’t the widest but Spy Rise should appeal if you want to awaken your inner James Bond or Jason Bourne. It’s not immediately obvious from its name but Sky Queen takes players on a jungle adventure. Created by Playtech and played using a 5 reel, 50 payline engine, it comes with plenty of extras, starting with the Sky Queen herself who turns the whole reel wild whenever she appears. Sky Queen comes with a pair of potentially exciting bonus features. The Fire Blaze Respin feature awards 3 streak respins. Each sun symbol that lands joins the triggering cluster and resets the respins back to 3. Those sun symbols all come with a cash value of up to 50 times your stake or a star attached. These are added together and then awarded at the end of the round. The star sun symbols award jackpot prizes which can reach up to 2,000 times your stake. The second feature awards 8 free spins. You can get a retrigger here as well as landing the Fire Blaze Respins feature. The design feels a bit primitive compared to some slots but is a nice fit for the theme. The range of extras impresses though. This is one rainforest trek that’s well worth undertaking. 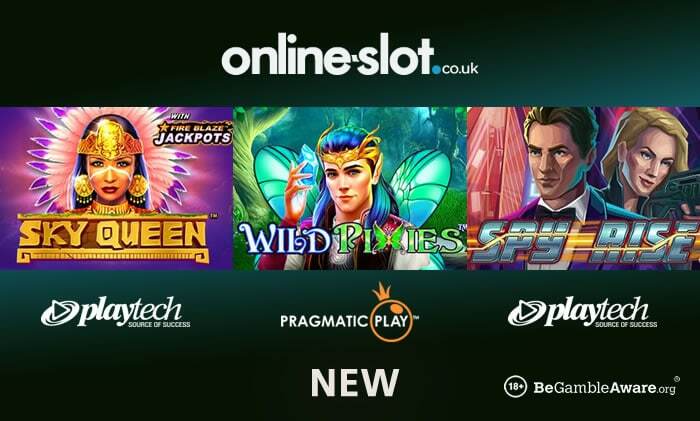 Wild Pixies, Spy Rise and Sky Queen are out now – for more new slots, check out our dedicated section. 18+, New Customers Only. T&Cs Apply. Offer 1: UK & IRL only. Deposits made with e-wallets not valid for this promo. Bonus wagering x35 on eligible games. Winnings from bonus capped at £/€500. Spins available after bonus is redeemed/lost. 10 per day with no wagering. Offer 2: UK & IRL only. Deposits made with e-wallets are not valid for this promo. Bonus wagering x35 on eligible games, game weighting applies. Minimum deposit £/€20. Full T&Cs apply.